WHITBY — Mona Bhamani is a firm believer that everyone should take pride in their home. The president of Castle Group Developments says her company has made it a priority for nearly 20 years to ensure condo buyers are surrounded with the types of amenities that all homeowners value, without breaking the bank. Their name is based on the slogan “Your home is your castle,” which is well suited to a project that’s currently underway in Whitby. Harbour Ten10 Condominiums will be constructed on about 1.5 acres of land at 1010 Dundas St. E. — the site of the former trailer park where redevelopment has been pending for more than a decade. It’s one of the first new condo developments the town has seen in years and the fifth Greater Toronto Area project for Castle Group, which is based in Markham. 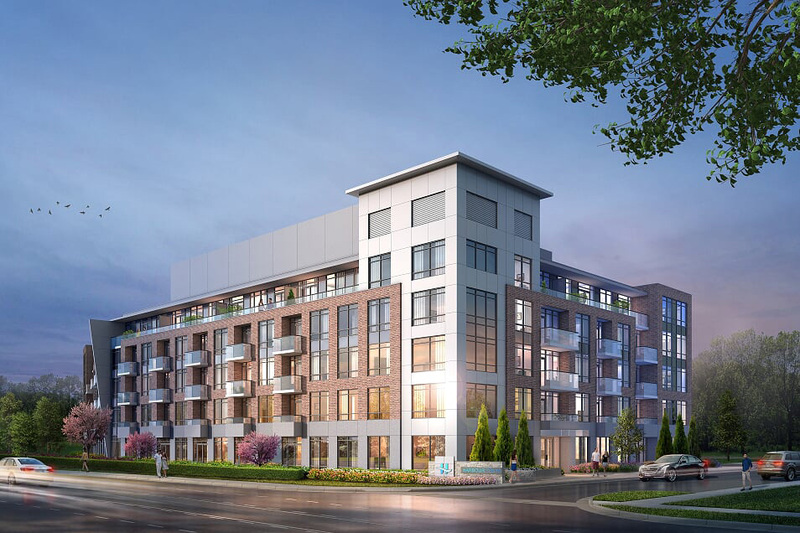 The five-storey building will include 110 units with premium standard features such as nine-foot ceilings, plank laminate flooring and granite countertops. There will also be an upscale, hotellike lobby with a concierge and a slew of on-site amenities, such as a lounge with fireplace, guest suites, green space with playground, a barbecue terrace and dedicated rooms for yoga, games and parties. Owner occupancy is estimated for 2020. “Most of my projects we are doing right now … everything is like a resort — that is my concept,” explained Bhamani, who trained as an architect. A resident of Richmond Hill, she admits she wasn’t familiar with the area prior to acquiring the property last year. She was drawn to the small-town feel, combined with a growing population and potential for attracting investors. A number of major developments are in the works, including Brock Street Brewery’s three-storey brewery, restaurant and banquet facility coming soon to the downtown, and a nature spa by Quebec-based Nordik Company, at Cullen Central Park. “When I did my research before we bought it, I surveyed the whole area, and it’s a very nice town,” she said of Whitby. When compared to municipalities closer to Toronto, she added that the prices of the suites at Harbour Ten10 will start in the mid-$300s, offering a more affordable option to first-time buyers and those hoping to downsize. The site’s central location — “a 10-minute distance” to key features of the town, including the waterfront, parks, trails, recreational facilities, downtown shopping and public transit — was another factor in her decision and is a nod to the project’s name. Whispers about redevelopment plans for the old trailer park began floating around the community in 2008 when then-owner 2074359 Ontario Ltd. submitted a proposal to the town to remove about 70 mobile homes from the property to accommodate high-density development. Their bid was met with major pushback from residents — some of whom were elderly or disabled and had lived there peacefully for many years. Whitby’s population continues to climb; it’s projected to jump from about 135,000 to 200,000 by 2035. Obligated to comply with intensification requirements set out in both the province and region’s official plans, council mulled over various versions of the plan for several years but no decision was made. In 2013, Kantium Development and Construction Inc. took over ownership of the property and shortly afterward, issued one year’s notice of termination to residents in the remaining approximately 20 occupied trailers. One year later, council approved Kantium’s plan to replace the trailer park with townhouses and mid-rise condominium apartments. “This development is the trial component of the redevelopment of the former trailer park use and aligns with the town’s intensification and redevelopment goals, which are aimed at providing high densities along significant corridors like Dundas Street in a way that contributes to the town’s vision of a complete and connected community,” said Roger Saunders, commissioner of planning and development at the Town of Whitby. Visit www.harbourten10.ca for more information.